I don’t know about you, but creating desserts and gastronomically sweet things in general almost always falls down to me in our family. Which I don’t actually mind since I quite enjoy baking the sweet stuff as opposed to the savoury kind. Mostly because when it comes to savoury we don’t usually see eye to eye on certain elements and we all end up in a messy and disastrous throw-down. By all means I in no way or form consider myself a pasty-chef-extraordinaire, and to this day, still have an awfully difficult time piping frosting onto cakes, regardless of the countless YouTube video tutorials I’ve viewed. I just can’t seem to master those delicate rose shapes and swirls. Though I do admit to being exceptionally good at simply slathering frosting onto a cupcake haphazardly with a frosting knife. I believe the term for that particular method is dubbed “rustic”. If there is one thing I truly enjoy baking it’s cheesecakes. I also enjoy eating them. Very much. And so does my family and friends. It’s also probably why they have rarely made a debut on my blog, because they’re essentially devoured within moments of being removed from the pan. And as you may have noted with the images of my classic vanilla cheesecake, it was virtually half eaten before I managed to whisk it away for photographing. 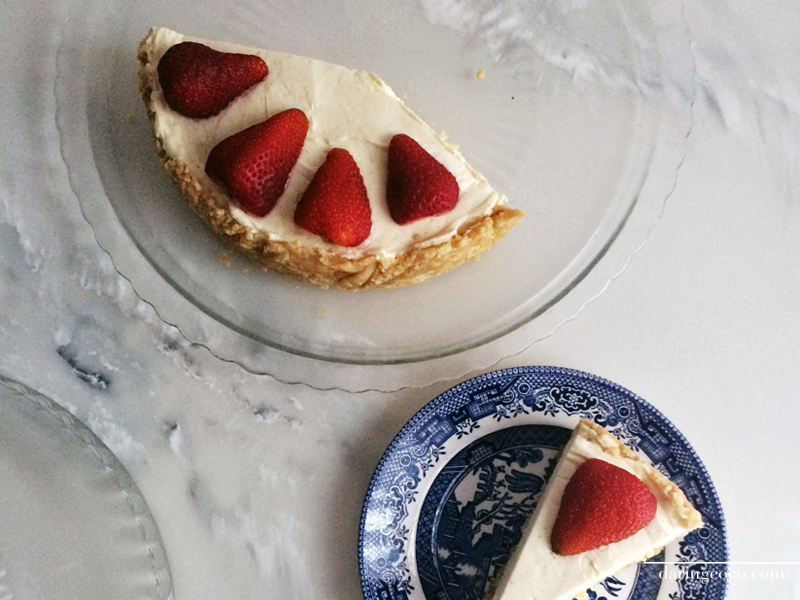 Which was a delicious shame considering how pretty he looked being all decorated daintily with fresh strawberries. But alas the hungry heart wants what the hungry heart wants, and shall not wait for my snap-happy needs. 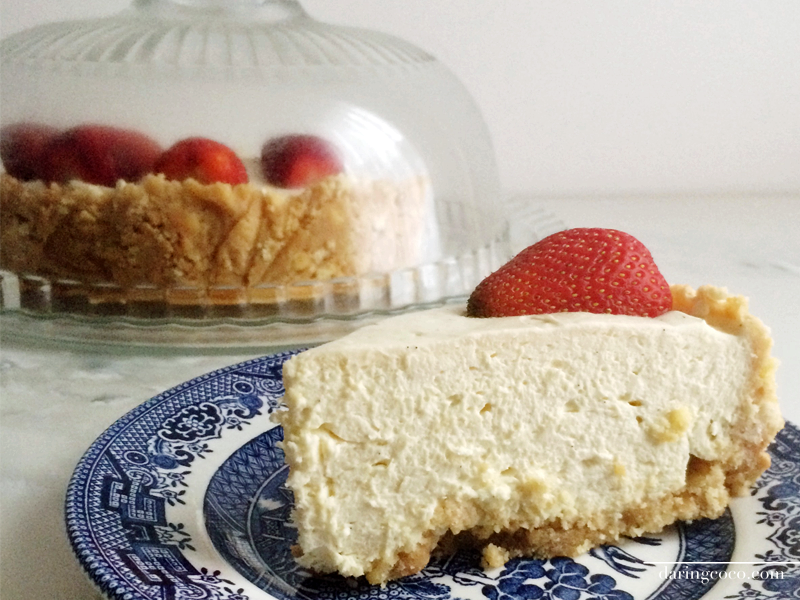 I originally encountered this recipe for a classic vanilla cheesecake online. A classic creation and favorite of Matt Preston‘s that appeared effortless enough. And best of all most delectable. So I wanted to try it over the long weekend. Since I knew I could whip it up in no time, I planned and had every intention of producing this the Thursday night prior. You know, so it would be ready for consumption first thing Friday morning. But alas I forgot to take out the cream cheese from the refrigerator hours beforehand so I had to postpone it until Friday. Needless to say there weren’t many happy tummies come Friday morning, especially when those tummies are expecting a classic vanilla cheesecake. And when you say they’ll be cheesecake well there better be cheesecake. 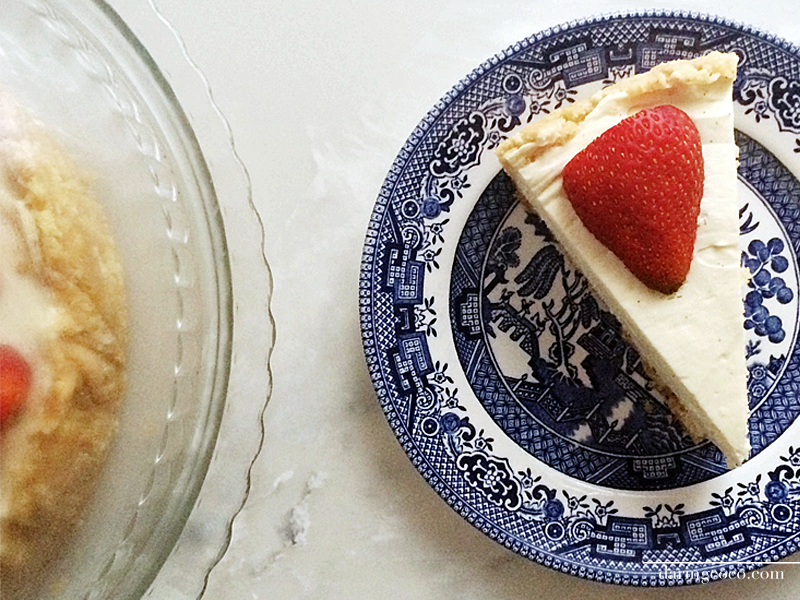 Luckily for me this classic vanilla cheesecake is idiot-proof. 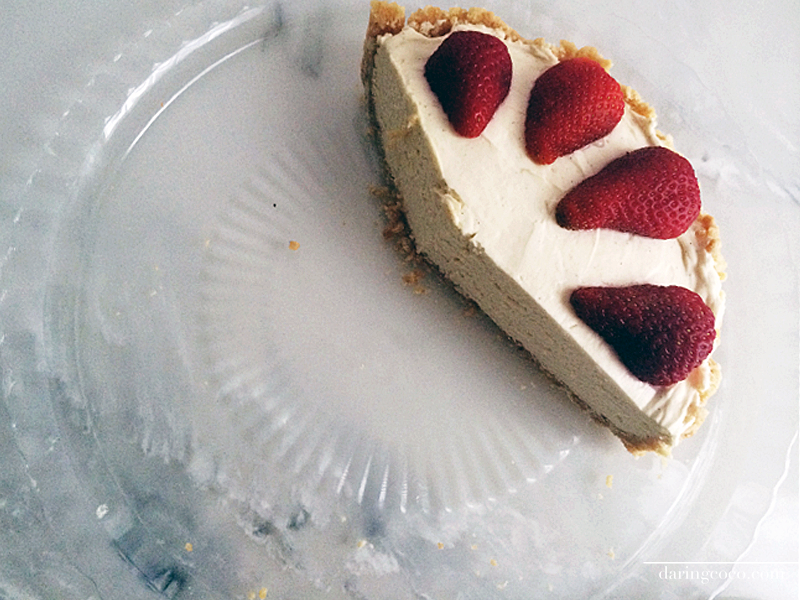 And since this is the no-bake variety, it ended up setting perfectly in no time. Which meant it was ready for devouring straight after dinner. Crises, somewhat, averted. With a food processor process the biscuits until the resemble fine crumbs. Add butter and process until combined, then press mixture into the base and sides of the pan and refrigerate for approx 10 minutes. In a separate small bowl sprinkle the gelatine over the boiling water and whisk until the gelatine has dissolved. Set aside to cool. In another bowl beat the cream cheese, sugar and vanilla until light and fluffy. Gradually beat the gelatine mixture until well combined. Fold in the whipped cream then pour mixture into prepared pan making sure to level the top. Cover and refrigerate overnight or until set then decorate with strawberries.